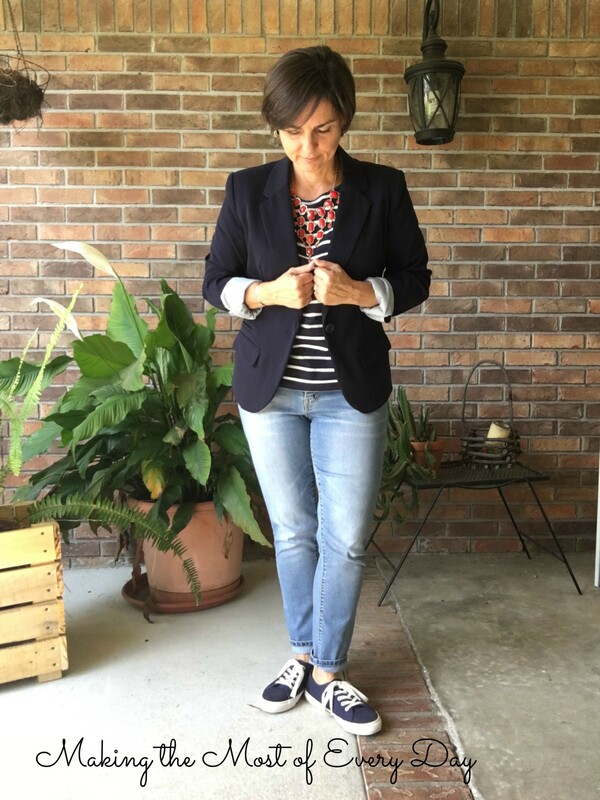 For this week’s prompt, Carrie is featuring a blazer + sneakers look on the Blended Blog. Be sure you check out her look! Two years ago, I had no blazers at all. Then one of the GYPO Style Challenge had a blazer on the shopping list so I bought a black one. That went over so well I soon bought a blue blazer and a white blazer. I love the way a blazer adds an outer layer that dresses up just about anything! You can wear it with heels and a blouse and it’s dressy enough for a date night or you can wear it with sneakers and a tee shirt for a more casual look like I did for this prompt. I picked a navy striped tee to go with my boyfriend jeans. I like the contrast in blues this way. Then I layered on my navy blazer (from Target) and rolled up the sleeves to show the mattress ticking stripes. I added the statement necklace for a bit of color and femininity. 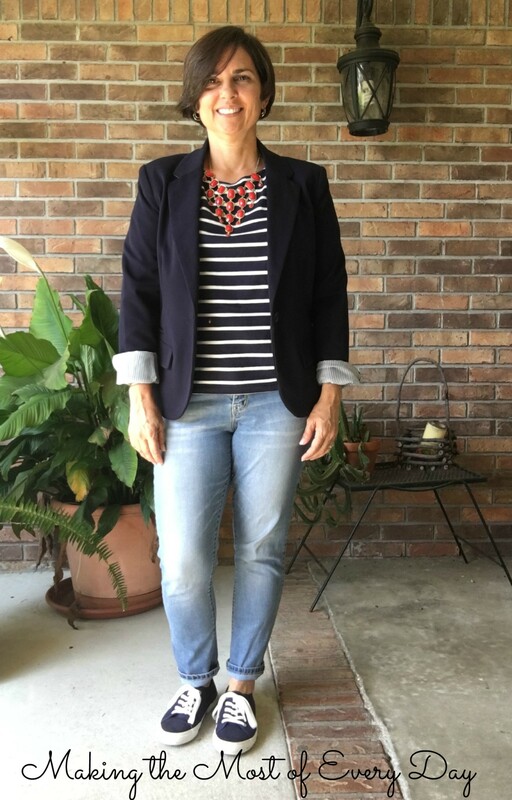 This nautical-inspired formula of blazer with sneakers is comfy enough for running errands or attending a graduation meeting yet it looks pulled together enough to be more than a super casual jeans-tee-sneaks look. If the day warms up and I need to remove the blazer, the necklace keeps the outfit looking put-together. Do YOU have a favorite way to wear a blazer? I’d love to see it! Tell me below and then share it on social media with our hashtag! Last week I shared my leggings look under a dress and told you how comfortable it was to wear on the plane ride. It was out of my comfort zone but very comfortable so I’ll wear this look again! Thank you Katie for the prompt! 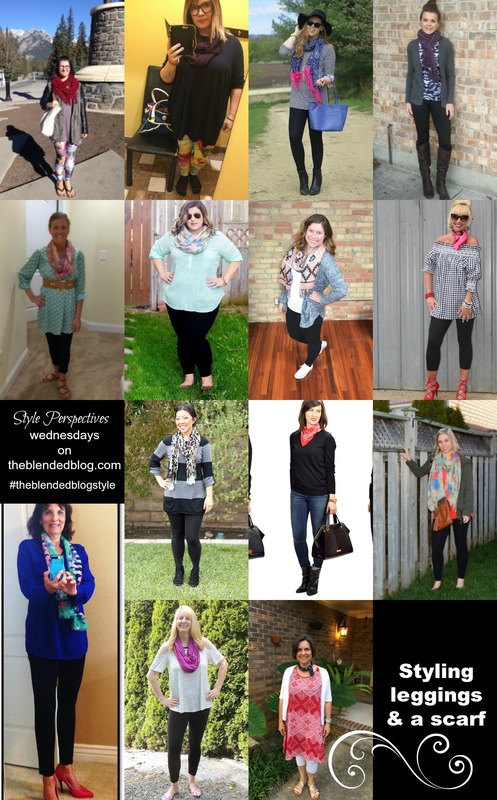 Look at all the other great looks from last week! Next week is me with A Graduation Look! 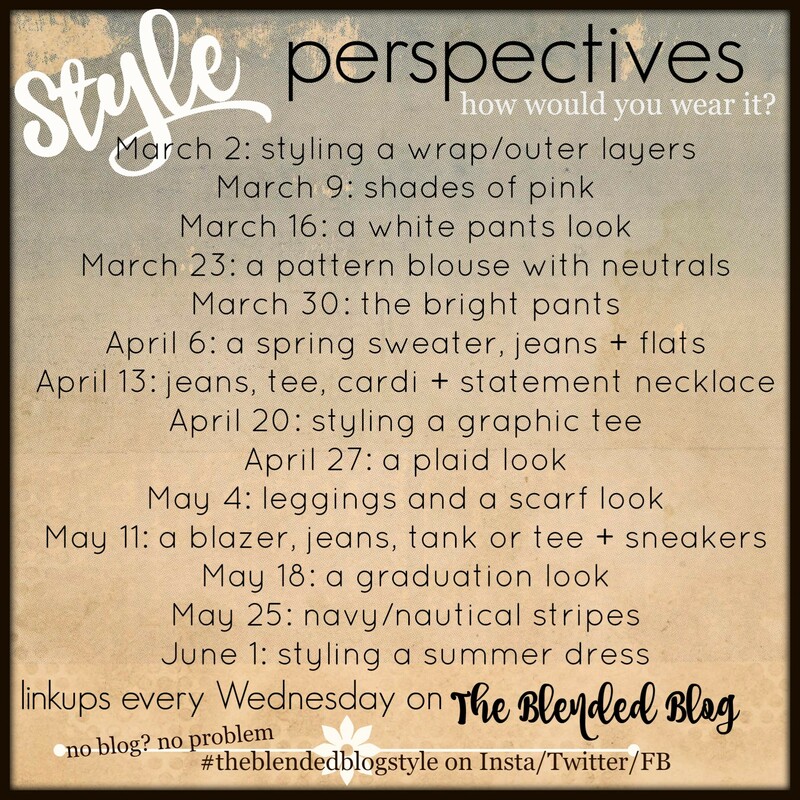 Since I have teens, this is the season of graduation and you might need some ideas for what to wear to graduation! I have a few to share with you so be sure to come back next week! This is a great look on you, Sheila. Love how you pulled in the red necklace. What a great look on you! I just love in the pop of red! You look classy and like you should be having a cocktail al fresco in the Hamptons! It’s a Merona. It was about $25, I think? You ALWAYS rock the blazer outfits, Sheila! And could your hair get ANY cuter?!? Gah! Haha! Thanks MA! I got a new do last week! First I love your haircut! I probably told you already but thought I would officially document it. But this outfit just screams you and looks so great! I can’t believe how much I”m loving the blazer and sneakers look, I need more blazers! Thank you Sarah! I prefer my hair this length! I do love the blazer look but would you use it much in CA? Do they blast the a/c there like they do here? You chose the best pieces to put together which makes a fabulous look. That Target is a dangerous place for me. I have been in there several times recently and done some serious damage to my budget but somehow missed this great blazer. Love that it is navy and not black. Might need to take out a loan and get one for myself. You wear it so well, Sheila. And I believe maybe your hair is a little different…shorter, maybe? Very cute. Very spunky. Great head-to-toe style. Yes, I did get a haircut! Very observant of you! I’ve been doing some damage at Ross lately. Yikes! Yes, I clearly do too, eh? Love this nautical look. The pop of red is perfect! It did need that little bit of color. I played around with different necklaces but I liked this one the best! I checked out your blog. Sei italiana? I love the nautical and Americana look you created today Sheila. Navy sneakers for the win! Great styling, you look so polished. Thanks Ada! I used to have a pair of white, navy, and red Keds in college. It’s fun to wear these types of tennies again! I missed you link up again. I’m so bad at those!